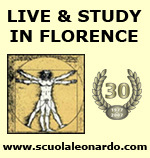 High quality Italian Language & cultural courses for those who want to study abroad in Florence. The Italian language school in Florence Scuola Leonardo da Vinci, officially authorized by the Italian Ministry of Education, was founded in 1977 and today Scuola Leonardo da Vinci is located in the historical centers of the most beautiful and important cities of Italy: Florence, Milan, Rome and Siena. We have 30 years of experience and and we are specialized in teaching Italian in Italy. Our Italian school in Florence is certfied for security standards and for access for the disabled, and has obtained the International quality assurance Certificate ISO 9001:2000, as a quality school of Italian language for foreigners. We offer, at all levels and all year around, Italian language standard, middle and long-term courses, cultural & art courses, professional courses and courses for Italian language teachers. Learn italian in Italy at Accademia Europea di Firenze - Italian language school situated in the historic center of Florence. AEF is also an italian culture, music and art school.